Karen W from Heart of the Matter Ministries International is a friend of Word of Grace Church and has been a blessing to us over the years. 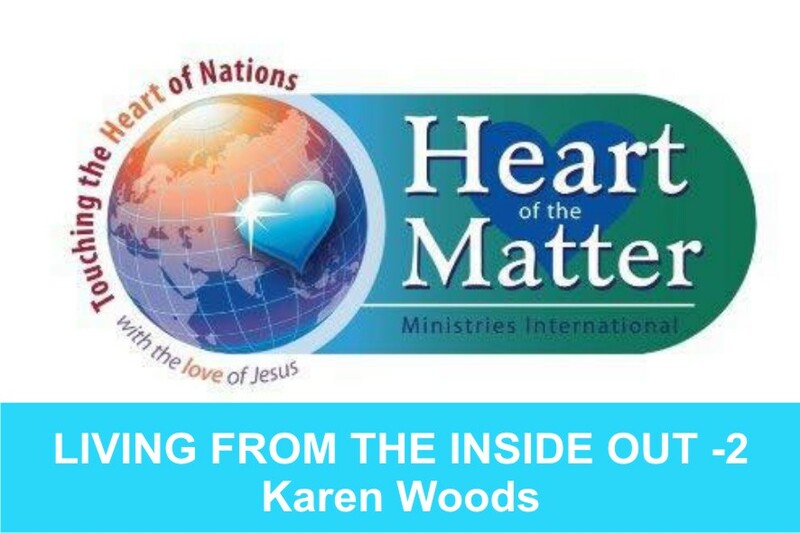 This is the second part of the message that was preached by Karen W at Word of Grace Church on July 2nd, 2017. To listen/download the audio please click here. First of all I want to thank Colin and Navaz for their pioneering work at Word of Grace church. What a perfect balance! What’s the word of Grace? When we can walk in the word of God that is filled with grace, our real selves can come out. It looks like acceptance even of our weaknesses. Let’s say someone struggles with an addiction. And they have a lot of shame around that. Grace will come and give honour to them. It is a sin, but we give honour and love on them to let them know that they still have identity even though they have an addiction. Truth comes in by giving instruction. Grace allows people to grow and process this thing out in faith. Churches that are so culturalised, everything is truth truth truth, instead of connection- talking, listening, walking things out. A couple of years ago I gave a testimony of how I terminated two pregnancies. But when I had people of Grace and Truth in my life, grace brought in healing. Truth by itself brings shame. Jesus told me that as I confess my sin, he is faithful and just to forgive me of all my iniquity. Then something wonderful happened. I am not ashamed of my past because there is no shame to it now. I love it because of how God delivered me of it. I love all parts of Karen. Even the Bad parts because God loves my bad parts. When I love all of me, I can bring my bad parts out to God quicker. Whatever is going on in your life will be covered by honour and respect when there is Grace. I talked about the kingdom of culture. I want you to give me some examples of culture that is not life-giving but is full of shame. Q. What in your culture brings shame? 1. People don’t eat with everyone. 2. Widows are not treated properly- they are excluded because they are perceived to bring shame. 3. People who live in small hamlets bring social boycott. 8. Hypocrisy- people pleasing instead of God-pleasing. 11. Valuing people based on their work and favouritism. 16. When someone gets divorced, their whole life is marked by that their whole life. 17. If a wife gives birth to a girl child, it is considered as a shame on the entire family. 18. If the children don’t do engineering or doctor, you are looked down upon. 19. If someone makes a mistake, they are not encouraged to speak in public again. 20. Language you speak, how you worship, etc. you are judged on the basis of that. One of the women said this kind of conversation never happens in the church. We are not talking about an American gospel. We are talking about the culture of the Kingdom. It is important for us to have breakthrough conversation. We need to know how to deal with conflict. I’m sure a lot of us have experienced unhealthy relationships in their life. We help people experience the love of God. our priorities are often mixed up. Its often pastoral work, ministry and family last. When things are so messed up, you wonder how the anointing could trickle down. This is what I believe- God is going to shift some things around. In fact he is doing it right now. If you don’t understand what healthy church looks like, the tendency is to go back to the things that the culture dictates. That is not what it is about. It is because who I’m connected to that allows me to do what I do. In him there is no Jew nor slaves... but we are all in all one in Christ. Not just positionally, but gender-wise, we are one in Christ. We talked about the 5 components of a healthy church- Truth, Grace, Gifts, Fruit, Teleois. When we can bring wholeness to the church, and you release this anointing, as it is in heaven, it will come to the earth. I am releasing a declaration of a new way of thinking that your mind will be renewed. That everyone can happen in the church. Everyone can have a part in the community of God. We are sons and daughter of the King. We are children of God. As wholeness comes into the church, people can show you their wounds. It is because of this that I could get free. I want to break shame. I know the smell of shame, it’s a demon from the pit of hell. It tells you that you are not good enough. I found myself pregnant twice before I turned 20 and I got 2 abortions. I went through many years of shame. But now I have no shame. I am proud to tell my story because he is a good delivering God. When I went to a healing counselling session- the Lord spoke to me and I saw Jesus sitting with me at the clinic where I terminated by babies. While there were protestors shaming me outside the clinic, the Lord himself was in the room with me. As the child was getting destroyed, the same way Jesus put back the ear that was sawed off by Peter, Jesus put my child back together. That’s the kind of God I serve. So I am not ashamed of the gospel. The reason I worship the way I do is because he delivered me and set me free. So when I feel shame, I am repelled by it. He has opened the door for me here in India of abortions, of different experiences. They said they can come to me because they felt safe. It wasn’t about the abortions, it was about how God loved and accepted me. I love Jesus. 1. Unsafe people think they have it all together instead of admitting weakness. 2. Unsafe people are religious instead of spiritual. Being religious is being judgemental all the time. 3. Unsafe people defend themselves when confronted instead of being open to feedback and understanding their own faults & mistakes. When you are healthy and free from shame, I have relationships, where people can come and speak into our lives about different things. 4. Unsafe people are self-righteous or falsely humble instead of being genuinely humble. 5. Unsafe people rarely apologize and own their actions, but when they do, the apology is not followed by a change in behaviour. When people apologize, it’s just saying sorry I got caught. But when you seek forgiveness, you intend to change your behaviour. 6. Unsafe people go to great lengths to avoid looking at (much less working on) their problems. 7. Unsafe people demand trust instead of understanding trust is earned. 8. Unsafe people do not admit fault and will make statements such as “I am sorry you feel that way” or any other form of an apology that does not contain confession of their fault. 9. Unsafe people blame others and work hard to assign blame to their situations instead of owning their responsibilities in the matter. 10. Unsafe people lie and manipulate. They aren’t honest about a myriad of things. 11. Unsafe people are stagnant and show little to no signs of growth. 14. Unsafe people resist the freedom associated with healthy boundaries instead of encouraging it. They have an unhealthy relationship with your “no” responses and often violate boundaries. 15. Unsafe people only flatter and never confront, or only confront and never flatter. The balance between the two is non-existent in unsafe people. 16. Unsafe people condemn us instead of covering our faults with grace or forgiveness. They will say things aloud like, “Oh, you forgot to pick up your son?” or “You didn’t know that?” Often repeated more than once to exploit weakness. 17. Unsafe people stay in parent/child roles instead of relating as equals. They often want to parent you or revert to childlike states in unhealthy extremes. Everyone has this trait to a certain degree, but unsafe people polarize in this department. When people act like babies or you make everyone your parent telling you what to do, that is unhealthy. When older people get around young people they do this. 18. Unsafe people are unstable over time. A season of instability is normal, but when a person seems to have chronic instability, that is a red flag. 19. Unsafe people influence us negatively. We often leave interactions with them feeling bad, but unsure why. They bring out the worst in us instead of promoting and inspiring our good qualities. 20. Unsafe people talk about others negatively when they are not around. We can be sure that we aren’t so special that we are excluded from their gossip. When a person assassinates another person’s character, name-calls or shares private information about others, this is a sign of relational manipulation common in unsafe people. there is one thing if you have an issue with someone and need to process it with someone. But if you infect others with your opinion by slandering them, that is unsafe. When you feel influenced by what another person has said about them, that’s an unsafe person. That is not celebrated or tolerated in the kingdom of God or in this church. 1. Safe people are honest and comfortable in who they are. 2. Safe people gladly submit to accountability. It means that they feel comfortable asking others to speak into their life or hold them accountable if they say they are going to do something. 3. Safe people accept you for who you are at all times. 4. Safe people will share their deep- heart just like you. They will be mutual. 5. Safe people walk in honour and respect. Respect means unconditional worth. That they treat you as an adult, not trying to do things for you. 6. In healthy safe relationships, it promotes growth. It brings you closer to God. Interdependent and independent churches- So when people leave you community in an independent churches, you don’t even know. You are so focused on yourself. When we are a healthy church that develops healthy relationships, equality and preach scriptures where God says about being citizen of heaven, we care about who is missing, without shame- something beautiful happens. Church should be the safest place on the planet. People like me who come into the church with a crazy past, God can do something wonderful. I am delivered, set free and a world changer.